The Barn Owl is the most widely distributed species of owl, and one of the most widespread of all birds and is most recognizable by its heart-shaped facial disc. 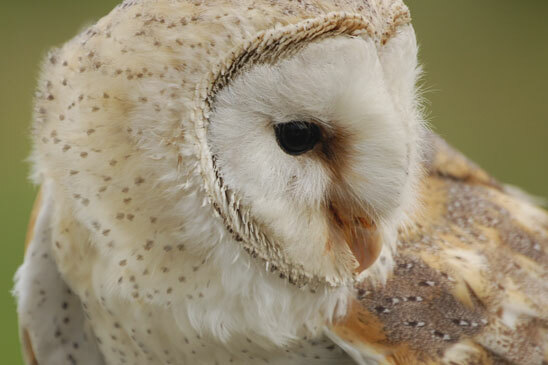 Barn owls readily live near people, often nesting in man-made structures and are excellent for rodent control and a breeding pair of owls can consume around 80kg of rodents annually. This is approximately the equivalent of 2800 mice. The Barn Owl is a pale, long-winged, long-legged owl with a short squarish tail. Generally a medium-sized owl, there is considerable size variation across the subspecies. The Barn Owl measures about 25–50 cm in overall length, with a wingspan of some 75–110 cm Adult body mass is also variable, ranging from 187 to 800 g , with the owls closer to the tropics being generally smaller. Its head and upper body typically vary between a light brown and a light colored and dark grey (especially on the forehead and back) feathers in most subspecies. The heart-shaped face is usually bright white, but in some subspecies it is browner. The underparts vary from white to reddish buff among the subspecies, and are either mostly unpatterned or bear a varying amount of tiny blackish-brown speckles. The bill varies from pale horn to dark buff, corresponding to the general plumage hue. The eye is blackish brown. The toes, as the bill, vary in color; their color ranges from pinkish to dark pinkish-grey. The talons are black. On average, within any one population males tend to be less spotted on the underside than females. The latter are also larger, as is common for owls. Chicks are covered in white down all over and at hatching are the ugliest babies. They do grow, however, into the most beautiful adults. Barn owls do not hoot. They instead produce a characteristic shree scream, ear-shattering at close range. Males in courtship give a shrill twitter. It can hiss like a snake to scare away intruders, and when captured or cornered, it throws itself on its back and flails with sharp-taloned feet, making for an effective defense. Also given in such situations is a rasp and a clicking snap, produced by the bill or possibly the tongue.